….NRIs support Petition has been circulated to send "The Hon’ble President of India"
Professor Davinderpal Singh Bhullar was sentenced to death in 2001 by a TADA court for a bomb blast that killed nine people outside the Youth Congress (YC) office in Delhi. 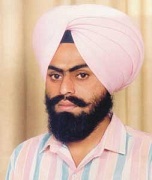 Then YC chief Maninderjit Singh Bitta was the target, but escaped with injuries. Mr. Bhular’s wife Navneet Kaur, 40, who was married to Bhullar barely two months before he went “underground--- applied mercy plea to the President of India. She has asserted that there was no evidence against Bhullar. Bhullar’s advocate K.T.S. Tulsi had urged in the Supreme Court that either his mercy petition should be decided expeditiously or alternatively his death sentence be commuted. President Pratibha Patil has rejected the mercy petitions of Devinder Pal Singh Bhullar of Punjab and Mahendra Nath Das of Assam following the recommendations from the Union Home Ministry, sources in the Ministry said. Navneet is organizing and leading agitations and campaigns in support of her husband. Her husband was deported from Germany, a European country, and as per rules and regulations, a person deported or extradited from the European country cannot be sentenced to death. She is accusing Punjab police of harassing the family to extract information about Bhullar. His mother Upkar Kaur, who was in Ludhiana to prepare for a meeting with lawyers, also said that her son “is in chardi kala“. Even her father was tortured and there is no information about her father in-law till date. She met the previous President, APJ Abdul Kalam, among others to push for clemency to Bhullar, has now appealed to President Pritibha Patal that “being a woman the President of India should understand my feelings. In 2003, Prof. Devinderpal Singh Bhullar filed a mercy petition to you and was supported by Amnesty International and also by the Committee on Human Rights and Humanitarian Aid of the German Bundestag. The whole Sikh nation also supported his mercy petition but you have denied it on May 26th, 2011 after eight long years. Mr. Bhullar was convicted on the sole basis of his confession before the police, which was admissible as evidence under the special Law i.e. Terrorist & Disruptive Activities Prevention Act, where as his co-accused who was also tried along with him i.e. Daya Singh Lahoria was acquitted by the trial Court for lack of evidence, as the said confessional statement could not be read against him, since he was extradited from U.S and the U.S authorities at the time of his extradition had obtained an undertaking from the Indian authorities that Daya Singh would not be tried under the TADA, special Law. So since in offences tried under the Indian Penal Code, the confession statements made before the police officers are not admissible as evidence, Daya Singh Lahoria was acquitted on the same charges, in the same trial, whereas Devender Pal Singh Bhullar was convicted. Mr. Bhullar was tried by the designated court-I, Delhi, under TADA (Terrorist and Disruptive Activities Act). He faced the trial for six years. He was sentenced to Death by the designated judge, Delhi on 25 Aug 2001, simply on the basis of his alleged confession recorded by a Deputy Police Commissioner during the police remand, which was recanted by Bhullar at the very first opportunity as that was obtained by coercion and torture. The prosecution miserably failed to prove its case beyond reasonable doubt and failed to produce any reliable witnesses. There was no eye-witness in the case, nor did anybody identify Devender Pal Singh as the person who planted the bomb in the car. Simply the police officials who recorded the confession were produced by the prosecution and the trial court convicted the accused purely on the basis of that confession. It is essential mention over here that in the case relating to the Bomb blast in which Sumedh Singh Saini IPS officer of Punjab, who was in 1991 on deputation as SSP Chandigarh, Devender Pal Singh Bhullar was acquitted of his charges by the Designate court of Chandigarh on 1st Dec 2006, as the prosecution could not produce any evidence worthwhile for convicting Bhullar. By convicting Devender Pal Singh Bhullar and awarding Death Sentence on the basis of the said confession, the trial court as well as Supreme Court not only committed a grave error of law, but also diverted itself from the usual practice and procedure laid down in other judgments under TADA. The confirmation of capital punishment upon Devender Pal Singh Bhullar and subsequent dismissal of his review petition by the Supreme Court vide the judgment dated 22.3.2002 and 19.12.2002, by a three judge bench of the Supreme Court of India, comprising, Mr. Justice M.B.Shah, Mr. Justice B.N. Aggarwal and Justice Arijit Pasayat in a case under TADA and there after dismissal of the review petition as well as curative petition by the same bench is grave injustice. Prof. Bhullar has suffered in limbo for the past eight years. He suffers from numerous health problems as a result of the continuous stress. It is unacceptable that he faces execution based on evidence extracted under torture. This cannot be acceptable to any civilized country and it should not be acceptable to India which prides itself as the ‘largest democracy in the world’.The case of Devender Pal Singh Bhullar is worthy of sympathetic consideration by the Hon’ble President Of India and Bhullar deserves a compassionate approach by being granted clemency and conversion of his Death Sentence to Life Imprisonment on the ratio of the judgment of the Hon’ble Supreme Court also. Because, the most important point which cannot be lost sight of, is that the senior most judge of the bench, Justice M.B. Shah acquitted the accused of all the charges vide a dissenting judgment. But the two judges, Justice B.N. Aggarwal and Justice Arijit Pasayat passed the majority judgment and after confirming the death sentence, erred in bringing the present case within the ambit of “rarest of rare case”. The view taken by the court is absolutely irrational because of the non-availability of corroborative evidence to prove a ‘defective’ confession. In one word, the judgment is erroneous and it has resulted in blatant violation of fundamental right of the accused to have a fair and impartial trial. Because, the fact that there was no eye-witness or direct evidence to connect the accused with the crime except the ‘confession’, allegedly made by the accused to the police officer and that too not produced before the magistrate with due diligence, deserved benefit of doubt in favour of the accused. Because, the alleged attempt to assassinate Maninderjit Singh Bitta cannot be called a ‘terrorist act” as per Section 3 of the TADA Act, 1987. If at all it was committed, it was a criminal offence with intention to kill a particular person and not to create terror in the society, thus provisions of TADA have been wrongly applied in the present case. Akal Takht jathedar Giani Gurbachan Singh appealed SGPC: To “take all possible measures to “save“ Professor Davinderpal Singh Bhullar, whose mercy petition has been rejected by the President. In a late evening press conference, the jathedar directed all “jathebandis“ (groups) to come forward for the purpose, irrespective of political affiliations. Shiromani Akali Dal today sought " direct and immediate intervention" of Prime Minister Dr. Manmohan Singh to save the life of Devinder Pal Singh Bhullar ", on grounds of statesmanship, humanitarian and civilised concern and over all national interest." A statement released on behalf of party patron Parkash Singh Badal and president Sukhbir Singh Badal here this afternoon also said that the Prime Minister should personally see that the highest norms of jurisprudence, legal precedents and issues of statesmanship are kept firmly in view in the matter and a sympathetic view taken. This, said the statement , would be "an act of grace" which will ensure that the atmosphere of acrimony, suspicion and estrangement between the Sikhs and the center s not vitiated any further further. Signatories to the statement, SAD Secretary General SUkhdev Singh Dhindsa, and General Secretaries Balwinder Singh Bhunder and Mahesh Inder Singh Grewal cited the judgement of the apex court in a similar case involving the state of Orissa and Dara in the case of murder of some Christians accused of engaged in conversions. The Court had commuted the death sentence to the accused to a life imprisonment in view of "the religious and emotional factors" that led to the crime. The Akali leaders said that there was no reason why the same yardstick should not be applied this case.